The MSC15 is a handy and cost effective spectral light and color meter. It measures twenty different light and color quantities as well as PAR plant growth and Bilirubin phototherapy functions with intuitive simple color touch-screen operation and S-MSC15 software supplied. A built-in diffuser window provides cosine correction with an f2≤3%. User software, USB interface and traceable calibration certification to international standards are supplied with the meter. The MSC15 is a must have tool for lighting professionals including: engineers, designers, manufacturers/distributors, architects, interior designers and facility managers tasked with qualifying conventional and solid-state (LED & OLED) light sources. For product specifications and configurable options for the MSC15 Spectral Light & Color Meter, please visit the Gigahertz-Optik main website here. To Order The MSC15 Spectral Light & Color Meter, Call Us Today At 1-978-462-1818. Your company manufactures a wide range of solid state lighting for various applications. You need to convince your customers that retrofitting their traditional site lighting with your new LED based lighting is a better way to go. But when comparing the light sources your filter based luxmeter is not doing a good job providing the light intensity and color temperature data you need to prove your claims. Also different customers are requesting different measurement quantities based on the lighting application, whether display, general, horticultural or other. 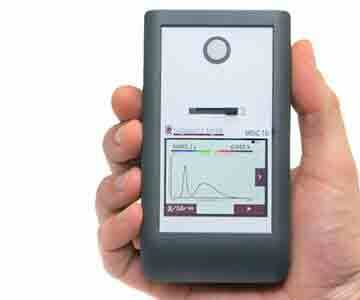 Gigahertz-Optik's handy MSC15 spectral light meter. It's light & color measurement made simple.